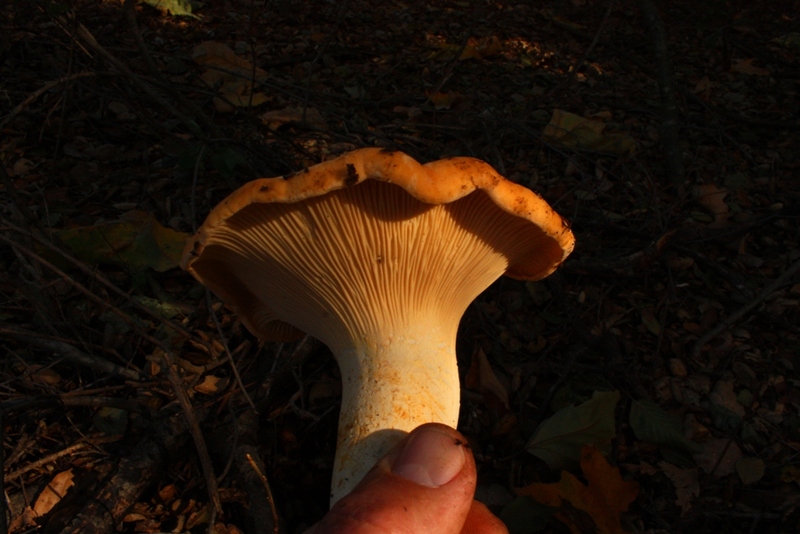 A freshly picked Chanterelle in the dappled afternoon light beneath a thick creek side oak canopy. 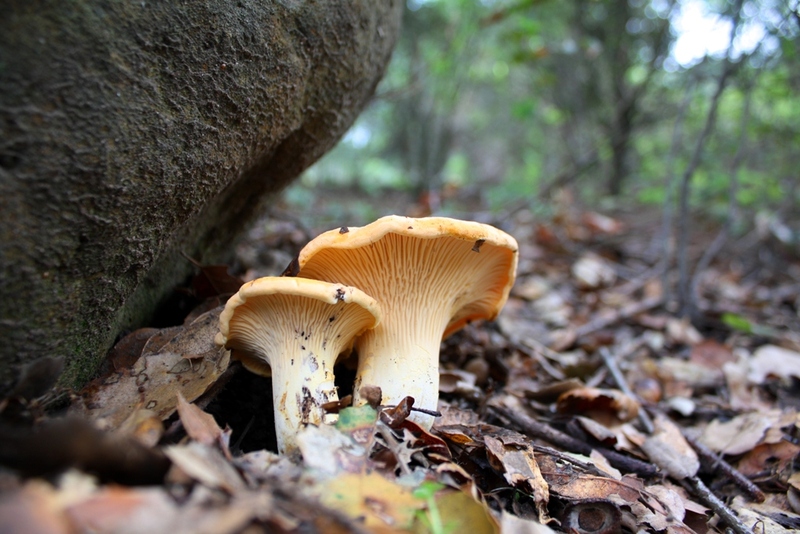 When it comes to foraging for wild foods Chanterelle mushrooms are the gold standard of Santa Barbara County forests. 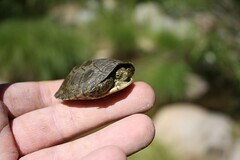 They thrive during the rainy season in the oak shrouded riparian habitat found in canyons and along the rivers, creeks and seasonal runnels throughout the region. Chanterelles make an exceptional seasonal addition to the kitchen table in fall and early winter when they are first popping up. Especially for Thanksgiving and Christmas meals, where you can regale your guests with the delectable flavor of a world renowned delicacy, and enchant them with tales of having foraged in the woods yourself to harvest them for their enjoyment. 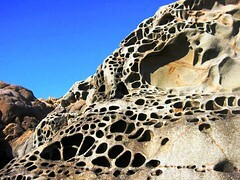 They are also an incredible treat if found when backpacking. 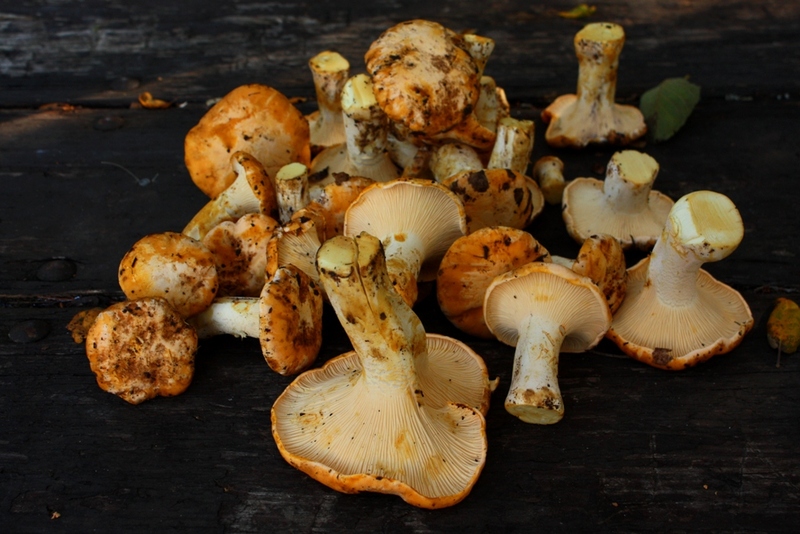 You would be hard pressed to prepare an easier yet more tasty meal when deep in the backcountry than fresh Chanterelles sauteed in butter or olive oil. Yet, while they make for a delicious fresh meal, they are very lean and low in calories. Their value to backpackers, in addition to scoring a meal you don’t have to haul in on your back, is their rich vitamin and mineral content, which can help replenish the nutrients lost during a hard day of hiking. They have an alluring, sweet and fruity fragrance that is often compared to apricots. Whatever the comparison, a bag full of freshly harvested Santa Barbara County Chanterelles smells incredibly good. With a meaty consistency and a mild, delectable flavor they are one of the few wild foods still worth harvesting in the age of supermarket convenience. 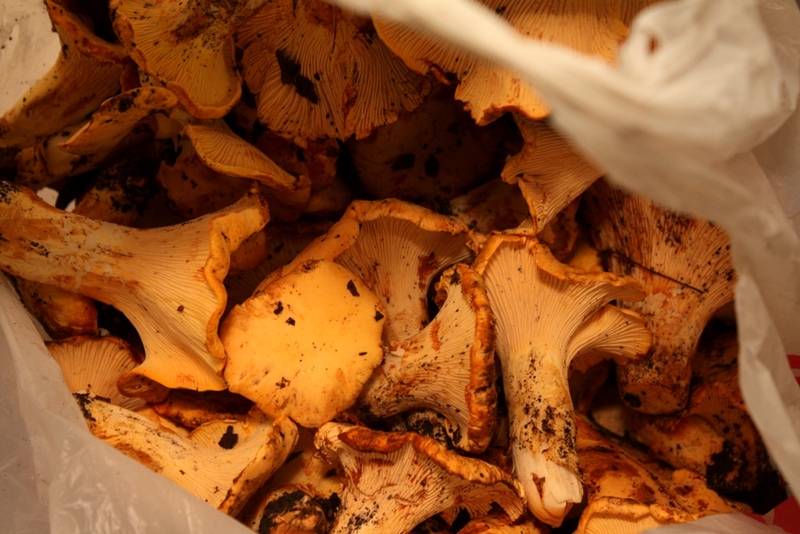 Chanterelles can only be harvested in the wild, because they do not lend themselves to domestication or farming. Anytime you see Chanterelles whether at a classy restaurant or at the grocery store fresh, dried in a bag or frozen in a heat and eat meal, they were picked by somebody out foraging in the woods somewhere. The Audubon Society’s Field Guide to North American Mushrooms lists the edibility of Chanterelles like those found in Santa Barbara County and the surrounding region as “Choice, with caution.” The warning, however, has nothing to do with Chanterelles. It’s to note that there is a poisonous mushroom called a Jack O’Lantern that may be mistaken for a Chanterelle by some inexperienced mushroom hunters. A Jack O'Lantern sprouting out from beneath a Coast Live Oak burl. Note the mushroom's gills. Chanterelles do not have gills. They have raised ridges, which might be described best as something similar to the ridges on our hands which make finger prints. 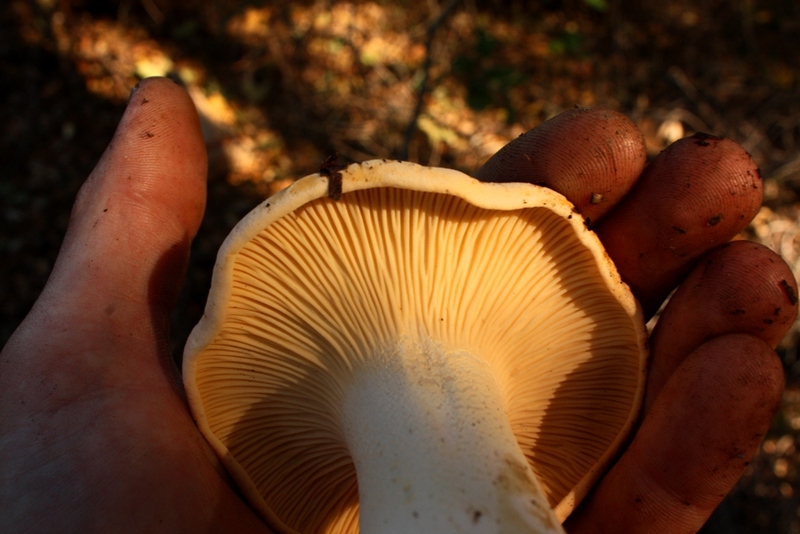 Plucked from the depths of a thick mulch layer, this mushroom is as clean and pristine as they come. Chanterelle mushrooms are mycorrhizal fungi, which means they are a type of fungus (myco) that lives underground on tree roots (rhiza) in a mutually beneficial or symbiotic relationship with the trees. The fungus and tree feed each other and together they are able to tap into a greater supply of nutrients than they could otherwise get on their own. 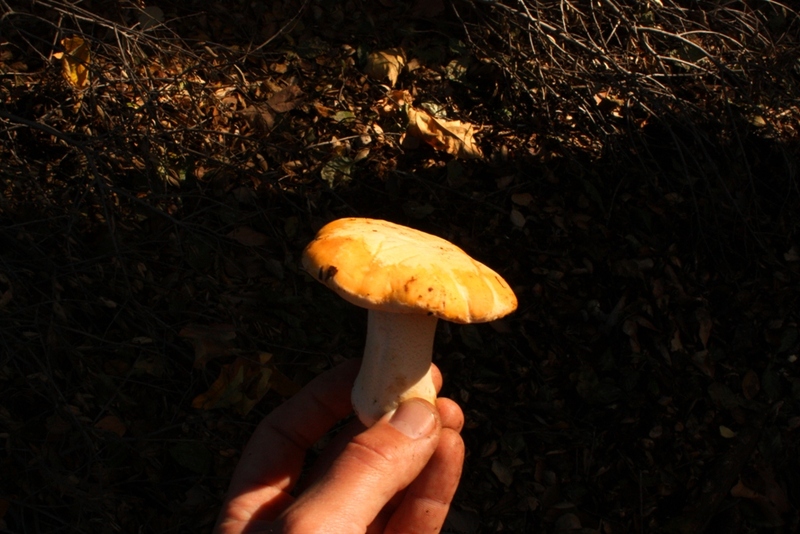 In Santa Barbara County, as well as the surrounding regions in Ventura County and San Luis Obispo County, and a fair amount of California in general, Chanterelles grow almost exclusively underneath or in near proximity to Coast Live Oak trees. 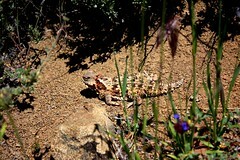 Although they can be found under conifers in certain areas of the state and in mixed forests where oaks are present. 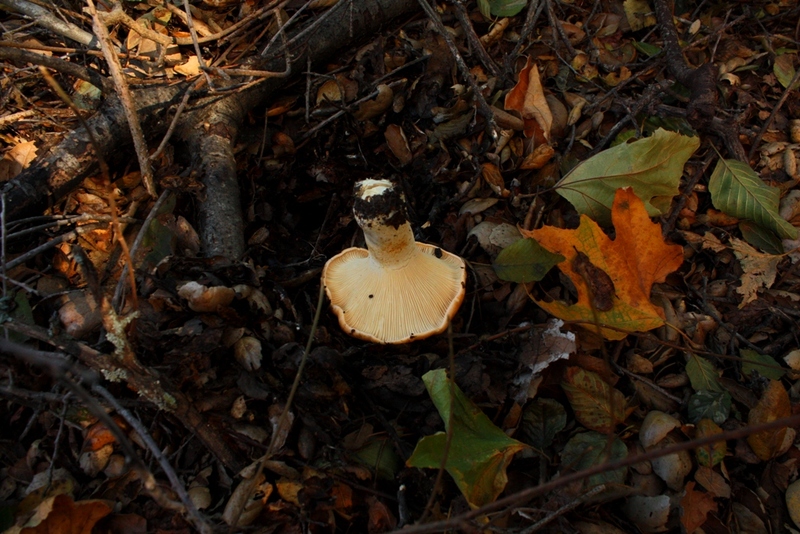 What grows out of the soil as a Chanterelle mushroom is actually the fruit produced by the fungus. The subterranean vegetative part or what might be thought of as the plant portion of the fungus is called mycelium. The mycelium grow in the soil on the tree roots and sprout mushrooms after absorbing seasonal rainfall or in some instances drizzle from a heavy marine layer or fog. Chanterelles and oak trees thrive together in a symbiotic relationship. Mycelium receives a constant supply of food directly from the oak tree. In exchange it provides the oak with the benefits of its greater nutrient absorption capabilities. The oak tree gains access to an additional supply of sustenance through the mycelium that it could not get from the soil itself due to its less efficient root structure. What might be thought of as the roots of Chanterelles, mycelium, are far more efficient at absorbing water and nutrients from the soil than are the roots of oak trees. Mycelium are far smaller and finer than the smallest of tree roots and are able to cover a much greater amount of the soil’s surface area. The fungus forms a micro web-like growth network that penetrates and spreads throughout the soil and is able to draw and absorb nutrients that larger tree roots simply cannot reach or draw in. The symbiotic relationship with mycorrhizal fungi strengthens the oak trees by increasing their access to water and nutrients, which in turn helps elevate their resistance to drought and lessen their susceptibility to disease and insect infestation. In fall and early winter is best, although they can be found throughout wintertime and into springtime, and with the right weather in summer too. Look two to four weeks after the first decent rainstorm of the approaching winter season. 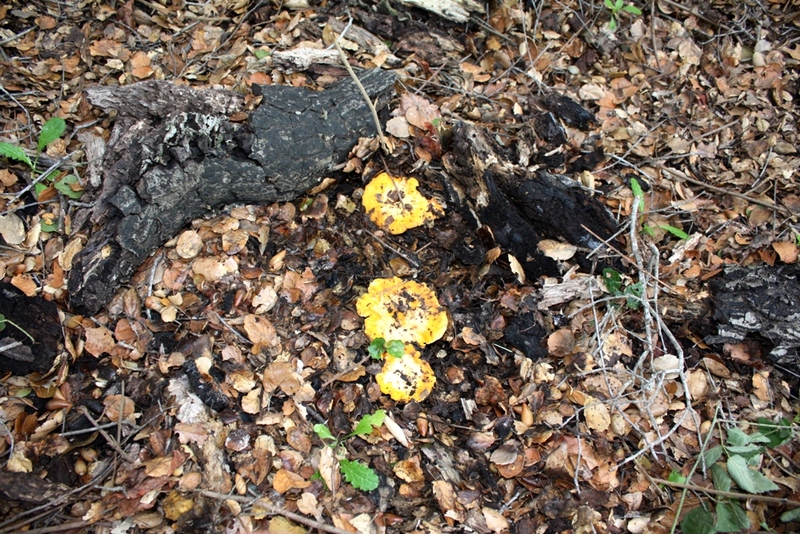 Chanterelles grow from the soil under, near and around Coast Live Oak trees in Santa Barbara County and the surrounding region, although I have also found them growing under Valley Oak (Quercus lobata). They can be found around the trunk of an oak tree or ten feet away or thirty feet away, because they grow from a fungus in the soil on the tree’s roots which spread far from its trunk. 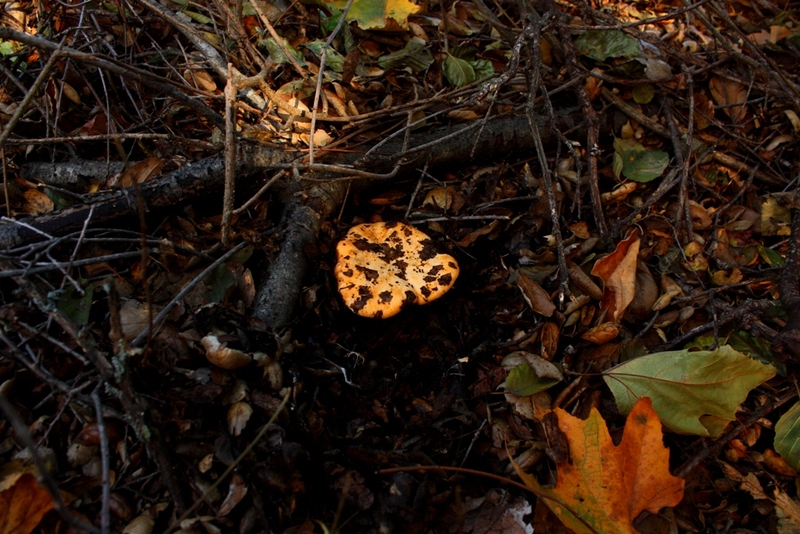 Chanterelles grow underneath the thick layers of leaf mulch that blanket the soil around stands of large oak trees. Depending on the depth of leaf mulch, which can easily be six to eight inches, and the age of the mushroom, it may or may not be visible to somebody walking by. Until they are large enough to push the mulch up and cause a bump in the otherwise flat mat of mulch the mushrooms remain invisible. In these instances it’s easiest to hunt for the mushrooms a month to a month and half or even two months after the initial rains of the season. The benefit is that the mushrooms harvested from deep mulch tend to be the cleanest and most pristine specimens found and have little if any dirt on them. 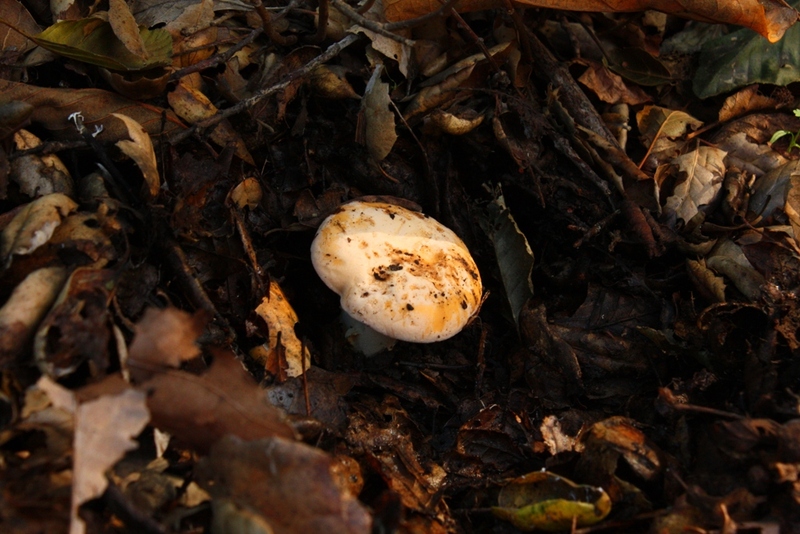 Mushrooms may also be found sprouting in among weeds, as long as an oak tree is near, and from bare soil around scattered oaks where little mulch has accumulated or under plants such as poison oak and lemonadeberry (Rhus integrifolia), which are commonly found growing around oaks and beneath the canopy. In this type of setting with little mulch the mushrooms are visible the soonest, but tend to be muddy. The photo shows an unusually clean one inch button sprouting out of the mud. 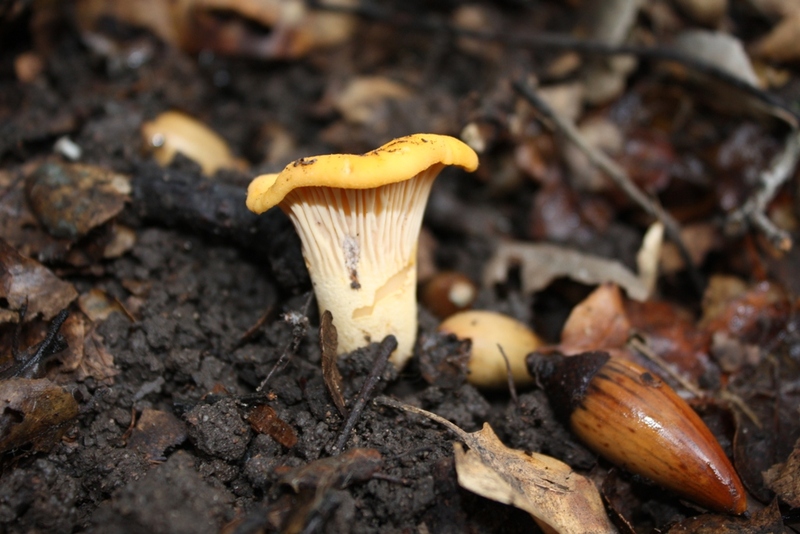 Chanterelles typically seem to prefer locations with more moisture and shade than sun, although in years of heavy rainfall patches of them can explode in sunnier and drier areas. And sometimes what seems like perfect Chanterelle habitat never produces a mushroom, while a seemingly less suitable zone sprouts them by the sack full every single year. Speaking of unsuspected mushroom zones, I once found a patch of Chanterelles growing between a freeway on- and off-ramp in Northern California. It must of been about a ten to twelve yard width of earth with a few oak trees that separated the two opposing lanes of roadway. I didn’t harvest the mushrooms because of their proximity to the roadway and the likelihood of pollutants being routinely washed by rain from the asphalt and into the dirt where they were growing. The remarkable efficiency of Chanterelle mycelia to absorb moisture from the soil also means the fungi is good at drawing in pollutants. In fact, certain types of mushrooms are used to help clean up and restore polluted landscapes and ecosystems in a process called mycoremediation. 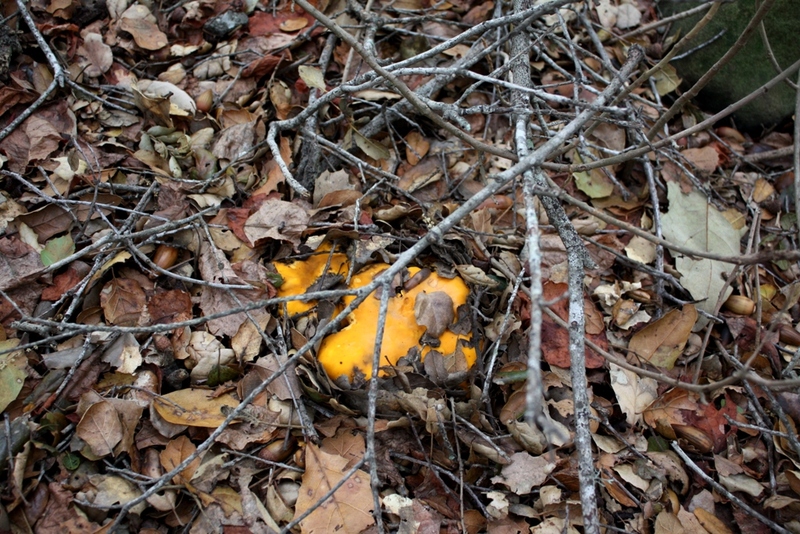 Fortunately most Chanterelles grow in pristine natural settings, but it’s something to keep in mind. 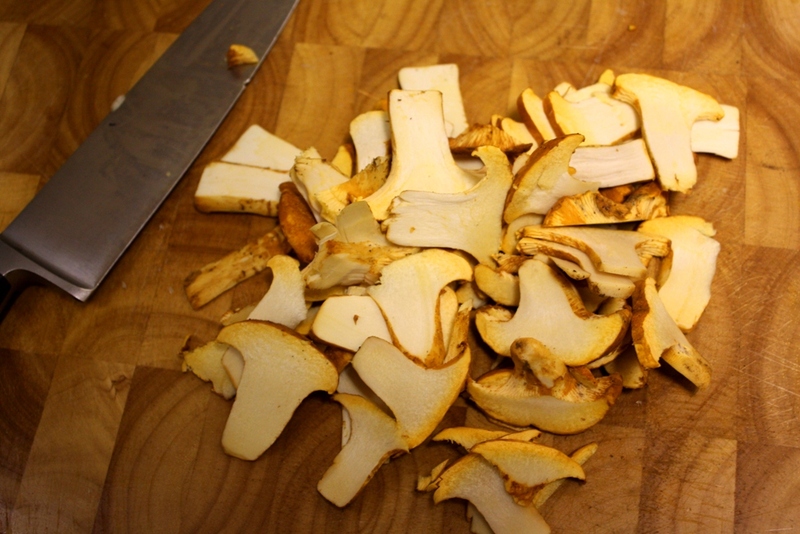 Chanterelles are like oranges. Not because they are both the color orange and smell good, but because you can pick them and more will return next season. 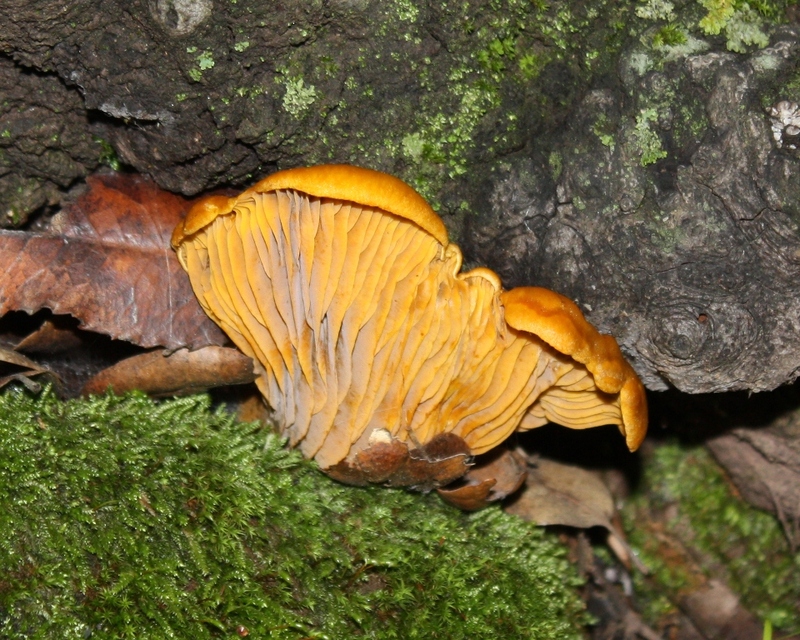 Chanterelles are something like a fruit, which is produced by a fungus that grows on tree roots. So long as the fungi or mycelia are not damaged they will continue to produce mushrooms seasonally, although some zones tend to be less frequent or lighter producers compared to other locations. 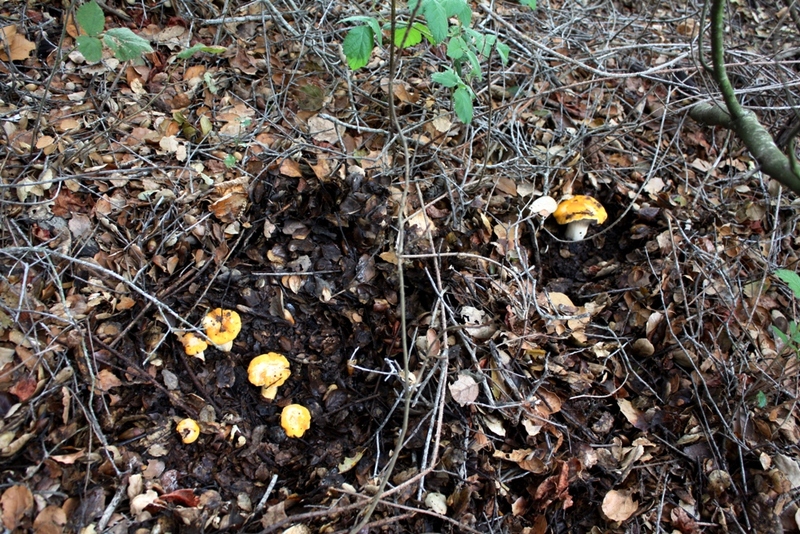 Some sites may not even sprout Chanterelles every year. But it’s not because somebody picked too many mushrooms the year before. The mycelia remain living in the soil aided by the oak trees and when the particular conditions are right again more mushrooms will pop up. You don’t have to leave a few mushrooms behind when harvesting a patch to ensure its regrowth the following year. Harvesting all the mushrooms, from buttons to big caps, in one spot is similar to picking all the oranges from an orange tree. More will grow next season. I am not, however, advocating a rake the slopes, clear cut approach to mushroom picking. 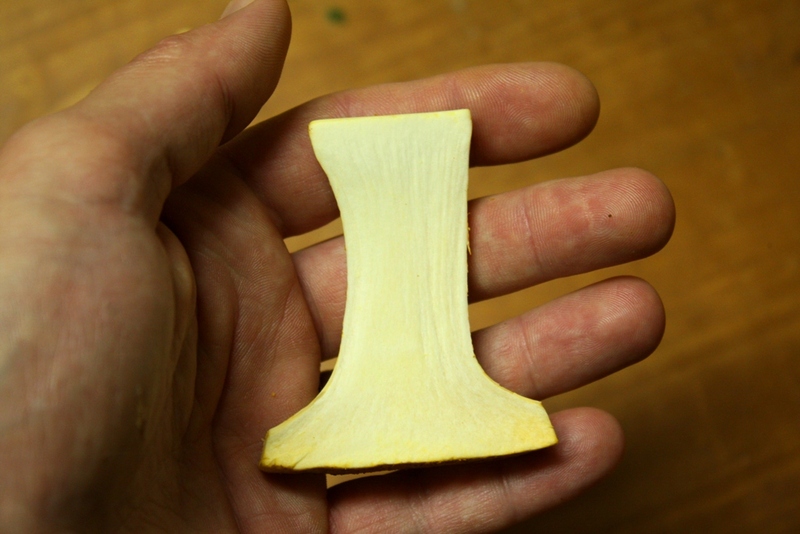 According to a study cited in “Chanterelle Dreams, Amanita Nightmares: The Love, Lore, and Mystique of Mushrooms” by Greg Marley, it’s best to pick Chanterelles by hand rather than slice them free with a blade. Although there has long been a lot of debate on this point and others say use a knife. Give mushrooms a cursory cleaning in the field before putting them into a plastic bag. Any dirt and mud on them will get smeared and spread around inside the bag so it’s best to remove as much as possible by blowing or lightly rubbing it off. The mushrooms can be left lightly cleaned (see photo under storage heading) in a plastic bag in the refrigerator for up to several weeks and used as needed. 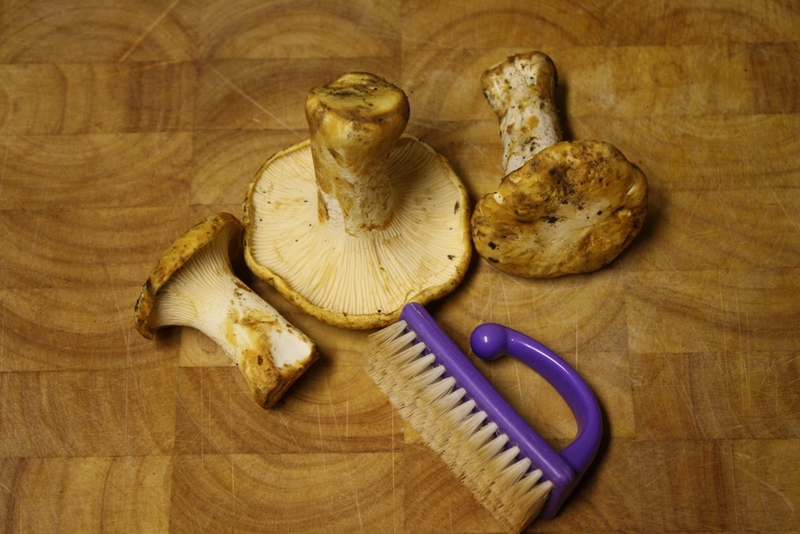 At home in the kitchen the mushrooms can be swept clean of dirt and grit with a nail brush just before being cooked. 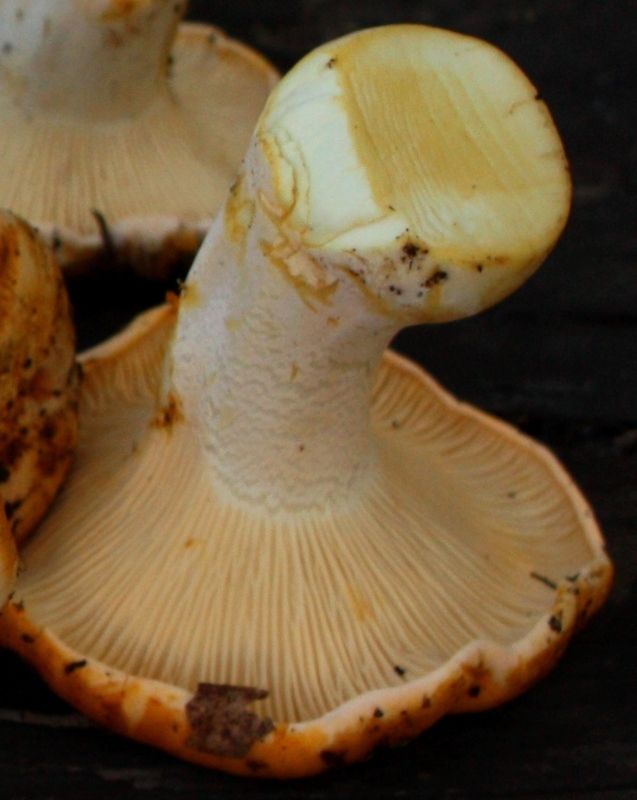 It is common for mushrooms to be darkly stained on their caps from dirt even after it has been brush off. Sometimes the stems are stained, too. These areas can be carefully sliced away or simply eaten. You can also usually remove the shallow stains by applying pressure when using the brush. The mushroom is soft and is easy to grind away. 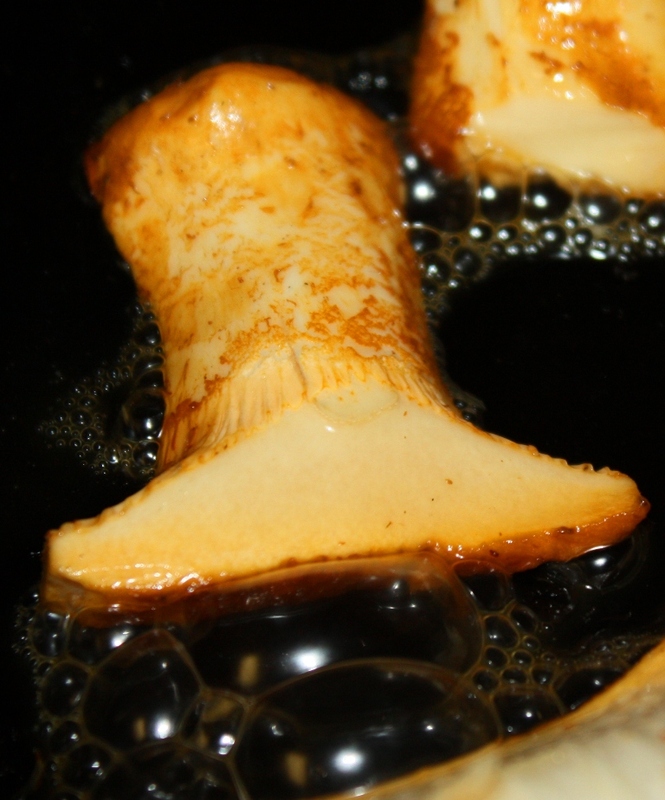 You want those sizzling bubbles to be the result of the mushroom's natural moisture content and not tap water. Avoid washing the mushrooms with water if possible. Washing them won’t ruin them, but it’s best to avoid it. Mushrooms soak up water like sponges and dousing them in hard mineral laden chlorinated tap water may alter their flavor, and besides that possibility it just doesn’t make sense when it’s usually unnecessary. The mushrooms will release the absorbed liquid when cooked and then you’ll be sauteing your wild delicacy in a pan full of boiling tap water, which will evaporate leaving its minerals and salts behind. However, Chanterelles harvested from muddy locations usually have to be washed to avoid grinding your teeth away on grit. In those cases brush the loose dirt off and then wash them as rapidly as possible. Gently squeeze dry with a paper towel. A sack full in storage in the refrigerator vegetable bin. Pulled from the bag as needed they are easily brushed clean, trimmed and sliced up for use. 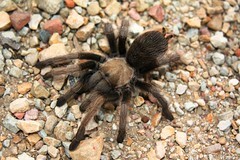 It is best to use a plastic bag to carry them in when foraging. I use plastic grocery bags from the supermarket. They wad up easily in a pocket so I can carry as many as I need and they can hold just about as many mushrooms as you would want to cram into one bag. Plastic bags are durable, will not rip and are non-absorbent unlike paper bags, which fall apart. Chanterelles are a sturdy mushroom not susceptible to mushiness. Kept in the coldest part of a refrigerator freshly picked Chanterelles will last several weeks in a plastic bag. The plastic bag traps moisture which helps keep the Chanterelles from drying out. Some edges of the mushrooms may, after awhile, get a little brown or soggy where they rest against the plastic bag, but these areas in most cases can be sliced off and the rest of the mushroom still used. Fresh is of course always best and mushrooms can get tainted with a funky tinge to the flavor if too old. If it looks too funky to eat don’t. “The arrest of five suspected mushroom poachers in Lompoc. . .arrested on suspicion of grand theft. . .a trespassing charge. . . suspicion of conspiracy. 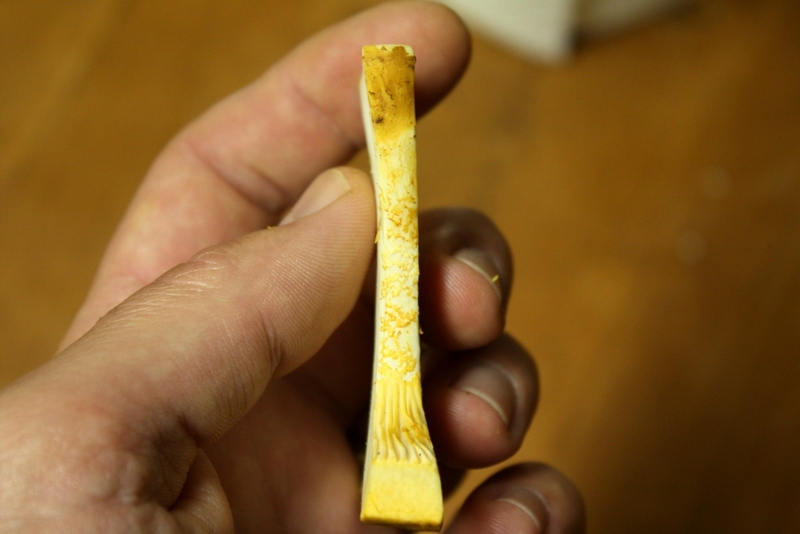 Three chanterelle mushroom poachers have agreed to a plea bargain in which the charges were reduced to misdemeanor trespassing and they were given 200-day jail sentences. For its simplicity and exhibition of the mushroom’s flavor this basic recipe is the best way to prepare Chanterelles. If the mushrooms are fairly dry and release little water then add butter sooner. The trick is to really fry ’em up golden brown giving them a nice searing in the pan in order to draw out all water and intensify the flavor. Otherwise, after the water has cooked out of the mushrooms and evaporated add a generous, don’t skimp, amount of butter, a light amount of freshly crushed garlic, a dash of salt and mix. Cook for another minute or two and then add several pinches of freshly chopped Italian parsley. Mix together and continue cooking for another minute. Remove from heat and serve while hot. Although it’s a bit of work to make this recipe it is by far, hands down, no holds barred the best way ever to prepare Chanterelles. At least no other way of cooking this mushroom that I’ve had comes even remotely close. 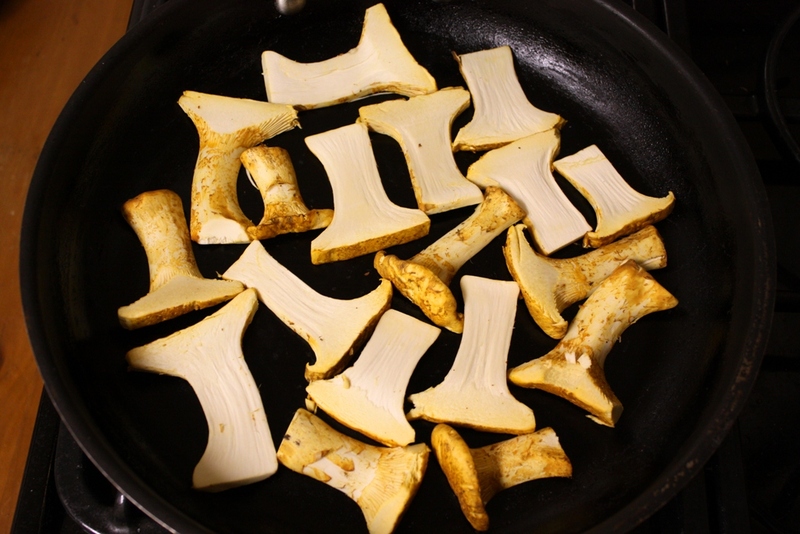 Follow the previous recipe for sauteed Chanterelles, but be sure to slice the mushrooms in larger, extra thick pieces. Cook as before. 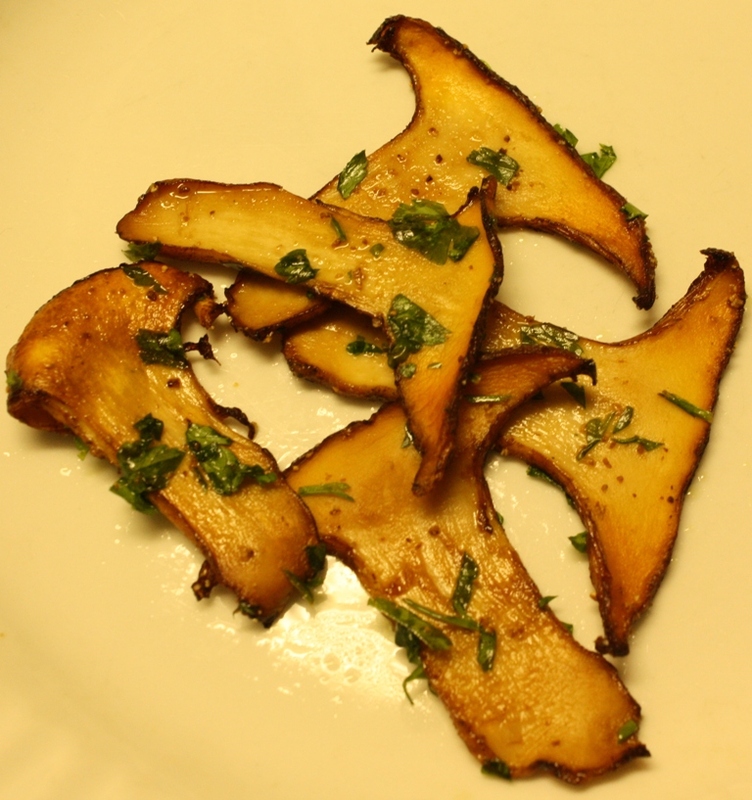 Pull cooked mushrooms from heat and remove from pan onto a paper towel to drain and cool. 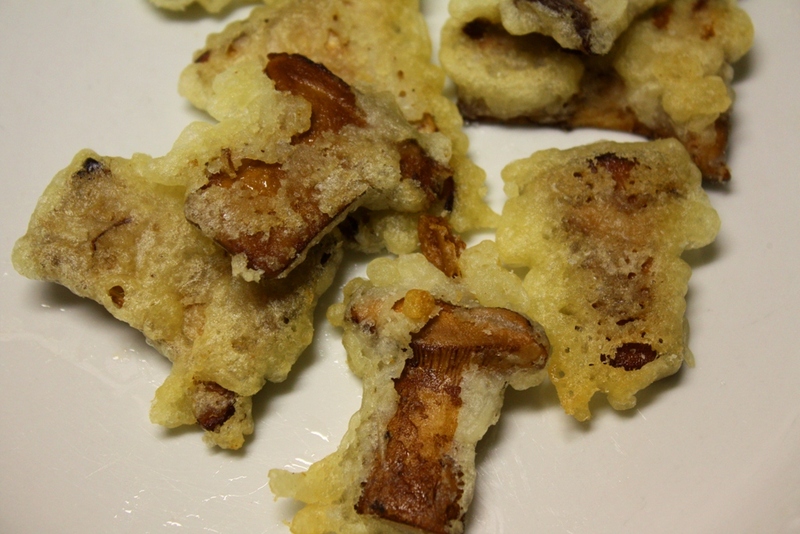 While the sauteed mushroom slices cool prepare the tempura batter according to its directions. Add enough grape seed oil in a frying pan so that it’s about an 1/8 to 1/4 inch deep. Dip the cooked slices of mushrooms in tempura batter and place in pan. Lightly fry sloshing the hot oil over the tops of the slices so you don’t have to flip them. Don’t leave in oil too long, you only need to crisp the tempura because the mushrooms are already cooked. Remove from oil and place on paper towel covered plate and dab off excess oil. Salt to taste. Chop and fry bacon in heavy duty ovenproof 6-quart pot over medium heat until lightly browned and slightly crispy. Remove pot from heat and use a slotted spoon to remove cooked bacon and place it on a paper towel to drain and save for later. Return pot to a burner on high heat. Add the meat and cook in bacon grease until browned on all sides. Reduce heat to medium-high and add the mushrooms, onion and black pepper. Saute the ingredients for several minutes stirring constantly with a wooden spoon until onion is cooked and turns translucent and the moisture in the mushrooms releases and evaporates. Sprinkle the flour over the ingredients in the pot and cook for several more minutes. Add the wine, broth, tomato paste, rosemary, bay leaf, brown sugar and bacon. Stir ingredients together until they come to a simmer and being sure the scrape any browned crusty bits off the bottom of the pot. Cover the pot and place in preheated oven and bake for 1 1/2 hours. Remove from the oven and add the carrots and pearl onions and continue baking uncovered about 30 minutes more. Remove from oven, stir gently to mix, let set covered for ten minutes and then serve with mashed potatoes. Other excellent recipes to consider include Chicken Marsala with Fresh Chanterelles and Cream of Chanterelle and Leek Soup. This entry was posted in Flora and tagged Chanterelles, Flora, Foraging, Fungus, Hunting, Mushrooms, Mycelium, Oak, Rain, San Luis Obispo County, Santa Barbara, Ventura County. Bookmark the permalink. Hi George. Thank you for dropping by. Thanks Allen. Glad to hear you had fun out there. Enjoy those mushrooms! thanks for sharing your photos. Up in Ontario Canada where I live, we start to see chanties in late July and by early September, they’re history. I find mostly the yellow ones, but my brother knows a spot where the red ones are plentiful. As the season progresses, I see fewer chanties, but I find quite a few Hydnum repandum and Hydnum umbilitcatum, which are also excellent. Any tips or recipies specific to puff balls? Thanks! Hey Allen. You know, I have only ever prepared puff balls I’ve picked one way, and that is just to slice and saute them in butter. For ones I’ve picked around here that are small, you end up with almost a hash like pile of pieces, but up in Oregon I’ve picked some soft ball and even soccer ball sized ones, which you can carve steaks out of. I’ve never actually incorporated them into a recipe, though. Just be sure they’re young and nice and white inside. My wife and I read your blog with pleasure and excitement at the thought of foraging in the SB Coastal Oak forests this coming chanterelle season. 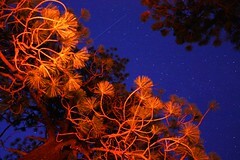 We had just finished up a successful morel season in the San Bernardino mountains, our first. We cooked them two ways last night for friends and relatives and everyone was blown away by its incredible flavor, texture and earthiness. We now have mushroom foraging withdrawal and cannot wait for the chanterelle season to start. Fortunately, we have the next few months to properly plan for a successful season and not end up in jail for trespassing or grand theft. We live in Los Angeles and would be most appreciative if you could provide some instructions for a beginner like what maps to buy, who to contact or clubs we can join that may have outings to teach newbies. All of a sudden, my mind is speeding ahead to wonderful Thanksgiving and Christmas meals lavished with irresistable chanterelles. Hey Sejon. 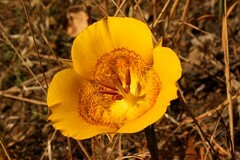 Glad to hear of your excitement in the field foraging. I do not have any suggestions on who to contact or what clubs may be around. I’ve never been a part of any such organizations or talked to any experts on the matter. I’ve also never used a map, because I tend to stick to the local counties around where I live and other parts of California that I know really well through years of personal experience. All my knowledge has come at the cost of hours in the field and years of time picking. But to be honest, and it is nothing personal, I would never reveal anything that might clue anybody in to where exactly to pick. 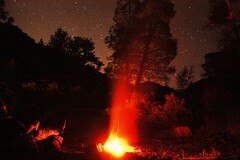 That is, other than to suggest looking when and where I mentioned in the post above. If you found morels, then I am confident you will find chants, too, with a little time. You don’t have to drive to SB either. There are plenty of spots down south. Thanks for stopping by. Good luck out there! I have been enjoying your posts all summer and fall, thank you very much for sharing such pleasurable things that you do and learn in nature. My wife and I are still looking to harvest our first California chanterelles. We went up to Santa Barbara area looking for them a few weeks ago, about a month after the early October rains but found only Jack-O-Lanterns. We did, however, end up with large beautiful local chanterelles in our Thanksgiving dinner when a very kind picker brought some to share at the LAMS meeting. He gave us some general hints where to look but so far we have found none. I suspect it may still be early down here. In any case, I think we are getting very close to picking our first California chanterelles……the excitement is building every time we are out and not finding them. Wishing you a healthy and enjoyable season. Couldn’t sleep and googled “chanterelle mushroom foraging santa barbara” and up came this wonderful article. Such fine photographs! You gave us all we need to know for the (hopefully) Thanksgiving rains to come this week. Thank You! Excellent post Jack. Detailed enough to suit anyones needs and interesting enough to keep us reading. Great photos also. Thanks. Very interesting stuff there. I’m a fan of a bit of wild foraging myself but am not always brave enough (or knowledgeable enough) to do too much mushroom foraging – I tend to stick to wild plant leaves for my stews etc. Your comment towards the end about foraging on ‘private property’ makes me wonder if one of my managers was right once… he threatened me with disciplinary action for removing some Morels which I found growing in some peat-bark compost in the carpark gardens. I thought he was nuts at the time as they didn’t intentionally have the mushrooms, they just sprouted in the bark they bought to keep the weeds down. But maybe he was right after all? Hey Gwen. I’ve not seen any as of a week ago, though I haven’t actually checked some of the more productive sites I know. It just felt too early. I’m actually in route right now to take a looksee at a good chant zone. I’ll let you know. 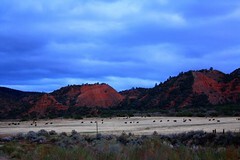 While we had, around my area, some early rains it wasn’t anything too heavy. So I suspect they’re just running a bit late this season for various reasons. Nothin’. This a heavy production zone too, but no sign of ’em. 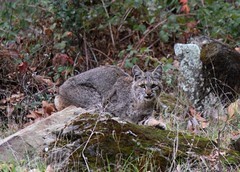 I’ve seen plenty here in SLO county. This week will be the one. Another interesting post – especially about the storage and preparation of the mushrooms – you don’t often see that kind of information, just whether they’re edible or not. Hi! I just discovered your website and love all the info. I grew up in Germany, and chanterelles were always on the menu in the fall. My mother used to brown chopped slab bacon and onion, add the mushrooms and braise for about 15 minutes, season with salt and pepper and add a large amount of chopped parsley. Absolutely delicious. Has any one had luck finding some with this rain?